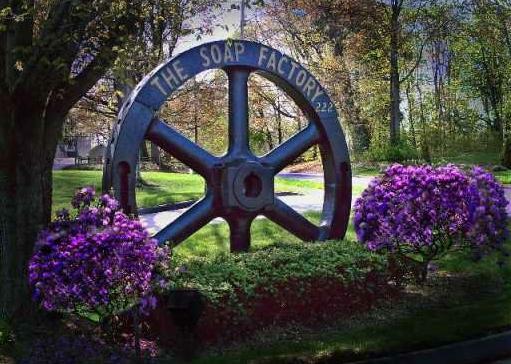 Welcome homeowners, residents, and realtors to the Soap Factory Condominium community website. The Soap Factory is a 116 unit, premier condominium community located in the historic J.B. Williams Soap Factory Building right in the heart of charming Glastonbury. The town green and center is a short walk away, and offers gourmet restaurants, grocery stores, bakeries, dry cleaners, and a post office to name a few. Soap Factory Condominium amenities includes an outdoor pool with lounge chairs, clubhouse, sauna, courtyard area with multiple charcoal grills, tables and umbrellas, four washers and four dryers on three of the four floors, a waterfall, a brook flowing thru the courtyard, a community gardening area and ample parking. The one and two bedroom condos are situated on lovely lush landscaped grounds in three multi-unit buildings. Glastonbury, Connecticut is a residential suburb located east of the Connecticut River in central Connecticut. Just a 10 minute drive from the state capital in Hartford, Glastonbury boasts a thriving economy, excellent school system, historical home sites, parks, nature preserves, a scenic landscape of meadowlands and hills, and a rich history spanning more than 300 years. Glastonbury offers the ideal mix of an old New England farm-town and an active suburban environment. Visit "Official Forms and Documents" to download the latest Information. The Association is again asking Owners to complete Unit Owner Information Form. This form enables the Association to have your car(s) registered and added to the parking list, provides the management company and Association with emergency contact information and tenant information. Failure to comply may result in towing of unregistered vehicles. Please make sure this form is up to date and complete. You can find the form by clicking "Official Forms and Documents"
Soap Factory Condominium Association, Inc.